All things considered I think my chickens have done fairly well is this record setting winter. We have close to two feet of snow on the ground where the chickens are and have had many nights of below zero temps. I’m using the “3 sided coop” model based on what is in the old literature. That is the coop has plastic on 3 sides (and part of the 4th truth be told). The theory is the chickens need a wind break and a roof, but it is better to be well ventilated. So far I’ve only lost one hen over the winter and she didn’t die overnight but sometime during the day. However on those cold nights they do roost close together. 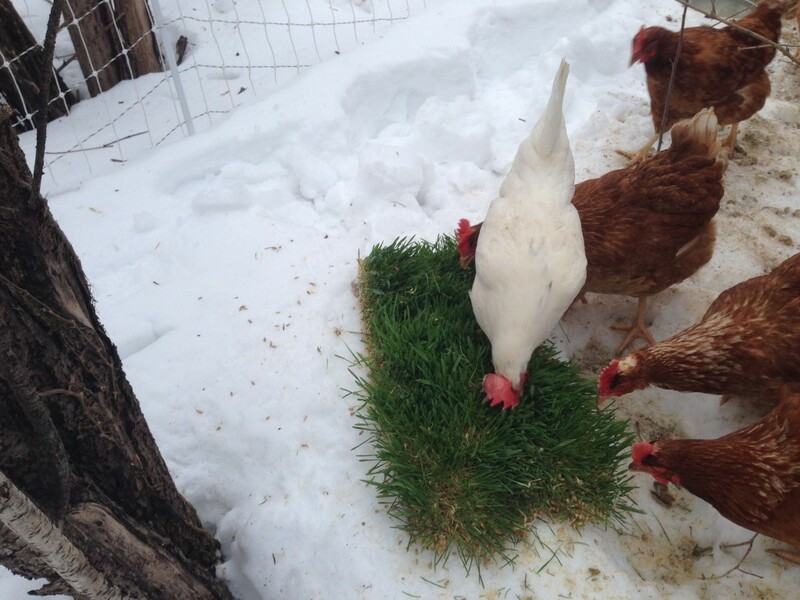 The chickens have not been able to reach the ground since sometime December, there has just been too much snow. It would have been nice to have some kind of standing grain crop that they could self harvest, but it would have had to be something with a strong stalk. All of the areas I left with tall grass is buried under the snow so I don’t think something like wheat would have worked. Therefore the chickens are living on a layer pellet produced by a local feed mill. Plus they get all of our food scraps. I’ve also taken to sprouting barley for them is seed flats. After 7 days or so it has a couple inches of green plus a lot of roots, they love it. It’s the best I can do this year, I’ll have to think about what I can do for next year.